Sam is a lively child, full of smiles and fun. He is into His music, trains and loves reading like any other eight year old boy, but when he was born it was obvious to his mother, Julia, that something wasn’t right. It is thought that Sam’s umbilical cord may have been damaged. Sam’s muscles didn’t develop as they should do and he was prone to twitches and jerks. When he was 18 months it was clear that he wasn’t hitting any of his milestones and after numerous tests and scans the family eventually got a diagnosis of Cerebral Palsy. 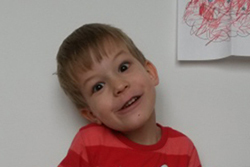 By the age of five Sam had also began to have seizures. Now aged eight, Sam is having regular seizures and needs support to do most things, including feeding and dressing himself. Julia is worried that it means she never has time for her other son, Ollie, who is a couple of years older than his brother and getting to a tricky age at school. When Julia came to the Children’s Respite Trust, she asked whether there was somewhere that Sam could stay while she had a day of “Ollie and me time”, as she called it. The Trust’s caseworker, Helen, began by writing to her social worker to request some state funded respite. Several phone calls, meetings and letters later, Julia’s family were finally granted a day of respite each month. While that was a great result, the Trust felt that just a little more support could go a long way and so, thanks to the support of the local community, we have been able to provide an additional carer for a day a month too.